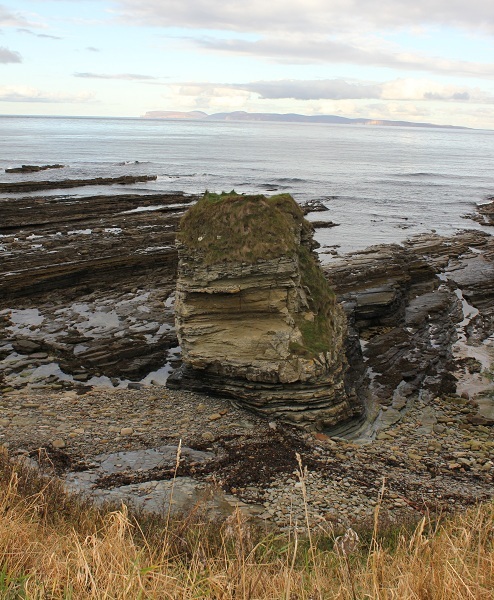 Thurso is the Northernmost town on the Scottish mainland. It's well-known as a top, if cold, surf spot in the UK, but it also has lots of good places for an invigorating walk. I've picked two walks in and around Thurso, but there are lots more if you go a bit further afield. 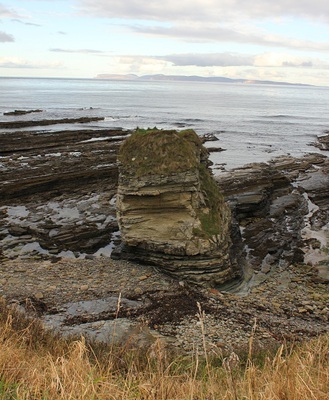 I'll be covering a Scrabster to Holborn Head walk in another article. The walk begins at Riverside Car Park in Thurso. This is really easy to get to either by car or by public transport. The start of the walk is across a footbridge over the River Thurso. It crosses over into some warehouses, and doesn't look very promising as a walk, but stick with it. Thurso Beach looking out over Thurso Bay to Dunnet Head. You'll emerge at the mouth of the river, and will be able to hear the rhythmic roar of the breakwaters. You then walk along to the end of the road and take a left at the final bungalow. 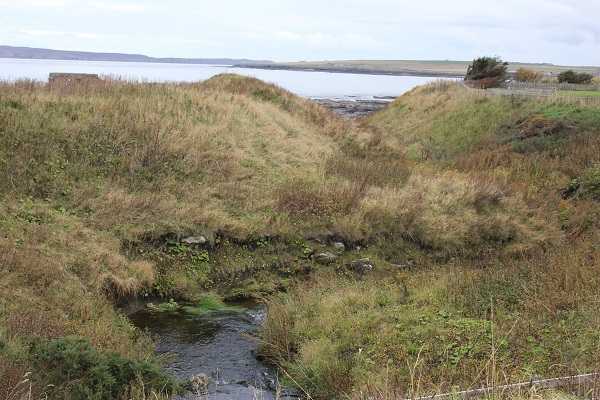 You'll soon be able to see the ruins of Thurso Castle. They are quite dangerous, so stick to the path and steer clear of the remains of the walls. 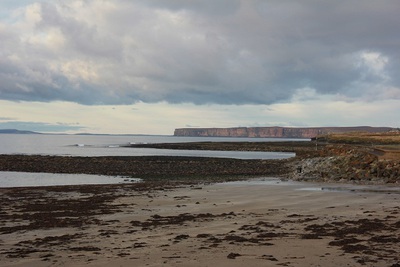 Then follow the coastline and enjoy the views out to Dunnet Head and to Orkney and the Isle of Hoy beyond that. 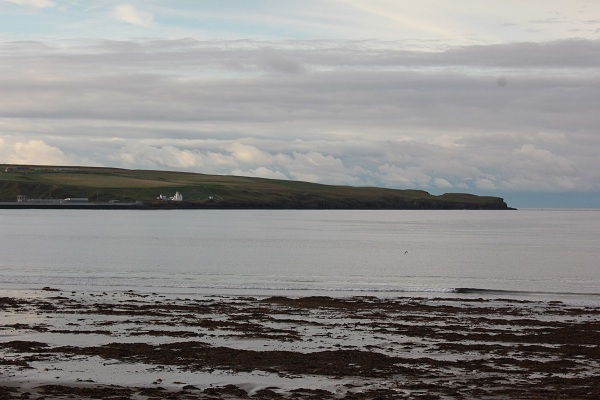 There are some interesting things to see on the walk like the Victorian harbour lookout, which gives a vantage point to look outwards to Holborn Head lighthouse across the other side of Thurso Bay. We retraced our steps back along the same route, because it was a very muddy October, but there is another option that's shown on the map I linked to, where you can head inwards to see the Mausoleum of Clan SInclair. This walk also begins at Riverside Car Park, but instead of heading left over the river, head down the river and then go left up the road by Old St. Peter's church. Then double-back and head through a little tunnel through the buildings to get down to the beach. 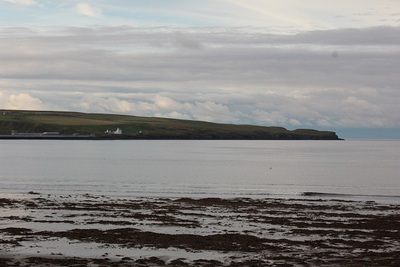 A view from Thurso beach over the bay to Scrabster and Holborn Head Lighthouse. 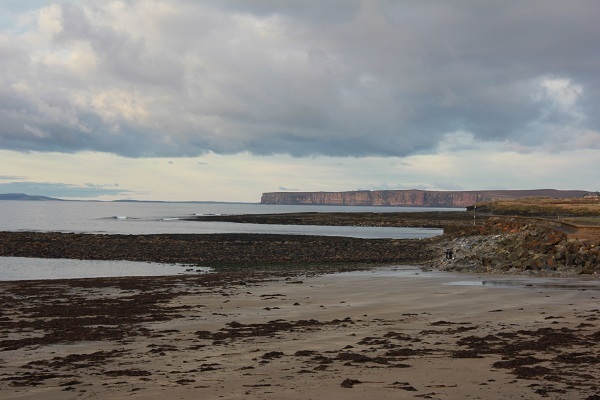 It's a wide, flat beach with beautiful views across to Dunnet Head, Orkney and Holborn Head. Rather than immediately setting out on the walk we wandered slowly down onto the beach and picked up some wide flat stones for skimming. The tide was out and so we were able to see the ancient graffiti in one of the caves towards the end of the beach. Although the oldest graffiti we could see was Victorian, it's rumoured that they wrote over earlier Viking graffiti. We then doubled back and headed up the steps to continue round Victoria Walk. The coastal pathway is well sign-posted, both with actual signs and with the local Caithness flagstones along the walkway. The path is well-maintained tarmac, and the most dangerous cliff areas are sturdily-fenced off. It turns into a footpath along a road for a short time, as you go through the little village of Burnside, but then you can get back onto a coastal path at the Coastguard's house. Once this coastal path comes to an end you're back on a footpath, and can then either follow the road round into Scrabster, or take the steps down into the harbour. There are a few restaurants and cafes in Scrabster where you can stop for a drink and something to eat. Then, you can catch a bus back to town, or walk back the same route back to Thurso. We actually did this walk at night, with torches to light our way. The sounds of the sea and the twinkling lights of Scrabster harbour and the distant lighthouses over the water made it a pleasant and unusual walk. I was with someone who grew up in Scrabster and was quite familiar with the route, so I would probably recommend that if you don't know the area you do the walk in daylight. If you do choose to do it at night, and follow the coastal path rather than the road, then you will need to take a torch. If you follow the road a little further, you'll find the way down to the stony beach. 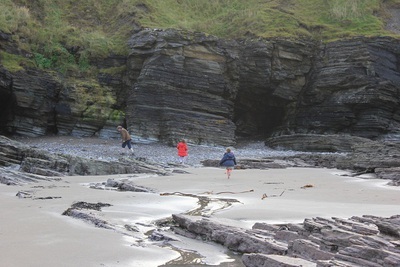 On the way back, instead of following the coastal path, we walked along the stony beach. The tide was out, so we were able to make it all the way along to the burn (which is a small river). It's just before the gun emplacement from the 2nd World War, and just after the coast guard's house. There's a little grassy path that you can climb up or down if you want to take the beachy route.